In the 1960s and '70s, Jim Jones, the charismatic leader of Peoples Temple, offered for some the perfect balance of spiritual fulfillment and political commitment. But in a 1977 magazine article, defectors and family members gave accounts of physical, sexual and drug abuse, as well as financial corruption and members being held against their will. On November 18, 1978, over 900 members of Peoples Temple died in the largest mass suicide/murder in history. Using never-before-seen archival footage and survivor interviews, Jonestown: The Life and Death of Peoples Temple tells the story of the people who followed Jones from Indiana to California and finally to the remote jungles of Guyana, South America, in a misbegotten quest to build an ideal society. STANLEY NELSON, a 2002 MacArthur "genius" Fellow, is executive producer of Firelight Media, a nonprofit documentary production company dedicated to giving voice to people and issues that are marginalized in popular culture. In its announcement, the MacArthur Foundation described Nelson as "a documentary filmmaker with a signature style and a distinctive cinematic voice," and noted that "his films on a wide variety of subjects convey powerful stories with evocative technique." Nelson is perhaps best known for his groundbreaking historical documentaries, films that illuminate critical but overlooked history. But Nelson's ouevre spans the range of documentary forms. With four films in competition at Sundance in six years and multiple industry awards to his credit, he is acknowledged as one of the premier documentary filmmakers working today. 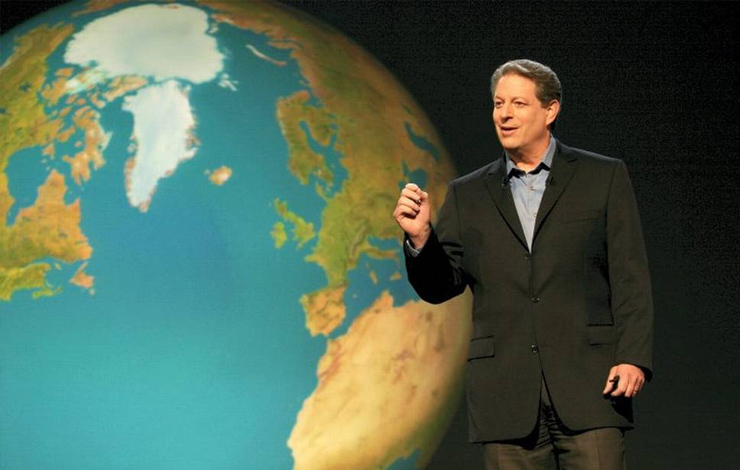 An Inconvenient Truth offers a passionate and inspirational look at one man's commitment to expose the myths and misconceptions that surround global warming, and inspire actions to prevent it. That man is former US Vice President Al Gore, who, in the wake of defeat in the 2000 election, re-set the course of his life to focus on an all-out effort to help save the planet from irrevocable change. In this eye-opening and poignant portrait of Gore and his "traveling global warming show," he is funny, engaging, open and downright on fire about getting the surprisingly stirring truth about what he calls our "planetary emergency" out to ordinary citizens before it's too late. DAVIS GUGGENHEIM was an executive producer on Training Day and has directed the feature film Gossip, both for Warner Bros. His television directing credits include episodes of Deadwood, Numbers, The Shield, Alias, 24, NYPD Blue, ER and Party of Five. His documentary credits include The First Year and Teach, both of which documented the challenging first year of several novice Los Angeles public school teachers. The First Year premiered on PBS in 2002 and received a Peabody Award and the Grand Jury Prize at the Full Frame Film Festival. Guggenheim's other documentary films include Norton Simon: A Man and His Art, produced for the Norton Simon Museum, and JFK and the Imprisoned Child, produced for the John F. Kennedy Library. MARK SAMELS joined American Experience in 1997 as senior producer and was named executive producer in 2003. He has been instrumental in bringing the series recognition as a leading presenter of world-class documentaries and presenting them to a wide audience through broadcast on PBS. In 2004, Samels launched WGBH's History Unit, supervising its first production, They Made America, based the then-new book by Sir Harold Evans. Samels also directed and co-wrote American Experience's A Brilliant Madness, a biography of the Nobel Prize-winning mathematician and schizophrenic John Nash. Samels is a founding member of the IDA and serves on the advisory council of the World Congress of History Producers. An independent documentary filmmaker and television producer since 1979, he is a graduate of the University of Wisconsin. In April 2004, 57 men from Clarksville, Arkansas, left their jobs and their families for Iraq as members of the 39th Infantry Brigade with the Arkansas National Guard, showcasing the largest deployment of the National Guard since World War II. Over the course of a year, the brother filmmaking team of Brent and Craig Renaud, born and raised in Little Rock, followed the members of the unit through their call-up, deployment and service, while simultaneously capturing the lives of their loved ones back at home. BRENT and CRAIG RENAUD are brothers and filmmakers who were raised in Little Rock, Arkansas. For 10 years, the Renaud brothers have been working with celebrated documentary filmmaker Jon Alpert and his production company Downtown Community TV Center (DCTV) on award-winning projects in places like Afghanistan, Cambodia, Bolivia, China, Pakistan and Iraq. Reporter Zero is the first documentary film about journalist Randy Shilts' groundbreaking AIDS reporting and the struggles he faced trying to get the nation and his community to reckon with the devastating truth about AIDS. While most publications shied away from covering what was considered a "gay disease," Shilts, the nation's first openly gay reporter at a major media outlet, reported from the frontlines of the AIDS crisis, sounding alarm after alarm in The San Francisco Chronicle and in his best-selling book, And the Band Played On. Shilts' controversial story exemplifies the power of journalism, represents a critical moment in the history of gay rights, documents massive institutional failure, and reminds us that in spite of flaws and psychic struggles, one person can make a difference. CARRIE LOZANO began working in film in the mid-1990s making hand-processed, experimental films. Reporter Zero premiered at the 2006 Berlin International Film Festival and won the Gold Medal Student Academy Award for Best Documentary. In 2003, she produced the Academy Award-nominated documentary The Weather Underground, which premiered at the 2003 Sundance Film Festival. In 1996, she earned bachelor's degrees in political science and film studies from University of California Berkeley and, in 2005, a master's degree in journalism from UC Berkeley's Graduate School of Journalism, where she studied documentary film with acclaimed filmmakers Jon Else and Deborah Hoffman.